Joseph von Fraunhofer (March 6, 1787 – June 7, 1826) was a German optician who was the first to study and classify the dark lines that appear in the spectra of the sun. During his lifetime he was known as the maker of the finest refractor telescopes in Europe. He also perfected the use of fine gratings, known as diffraction gratings, for producing and analyzing light spectra. Fraunhofer was born in Straubling, Bavaria, the son of Franz Xaver Fraunhofer and Maria Anna Fröhlich. Fraunhofer's father was a craftsman producing fine decorative glass. By the time Fraunhofer was 11, he had lost both his parents, and was apprenticed to Philipp Anton Weichelsberger, a mirror and decorative glass manufacturer. While Fraunhofer must have learned much about glassmaking during his apprenticeship, the environment was generally oppressive, and he was not permitted even to attend classes on Sunday that were reserved for apprentices. An event occurred in 1801 that was to change Fraunhofer's life and the history of science. Weichelsberger's complex, which housed both the glass studio and living quarters, suffered a collapse, and Fraunhofer and Weichelsberger's wife were trapped by the rubble. Mrs. Weichelsberger lost her life in the incident, but Fraunhofer, protected by a strong cross-beam, survived. The near-death and rescue of the young Fraunhofer caught the attention of Maximilian IV Joseph, Prince Elector of Bavaria, who is said to have been involved in the rescue effort. Maximilian invited Fraunhofer to his castle, and was able to provide some financial support for him. Maximilian also pressured Weichelsberger to allow Fraunhofer to attend classes on Sunday, and put him under the care of Joseph von Utzschneider, an attorney with entrepreneurial leanings. Soon after Fraunhofer and Utzschneider met, the latter partnered with Georg Reichenbach and J. Leibherr to open the Mathematical Mechanical Institute Reichenbach Utzschneider Liebherr, devoted to the manufacture of surveying instruments that required high-quality lenses for their manufacture. In 1804, Fraunhofer, with the help of a grant from Maximilian, tried to establish his own business, but could not earn enough to support himself and was forced to return to his former employer. But in 1806, Utzschneider offered Fraunhofer a position at the Institute, which was now located at Benediktbeuern Abbey, formerly in the hands of the Benedictine order. Here he learned the art of glassmaking from Pierre Guinand, who had already perfected some of his own innovations. From this point on, Faunhofer began to show his worth. By 1809, Fraunhofer was offered a junior partnership in the firm, and was put in charge of its day-to-day operations, which two years later meant managing a staff of over 40 people. By 1812 Fraunhofer was producing quality refractor lenses with a diameter of seven inches, a respectable size for a telescopic lens at that time. Fraunhofer wanted to solve the problem of phantom coloration in the images of telescopes and other optical instruments. To accomplish this task, he decided to analyze the light of the sun, and the spectrum of different colors it produced when it passed through a glass prism. In order to examine this effect more accurately, he examined the spectrum of sunlight using a telescope, and thus invented the first spectroscope. He was surprised to find scattered throughout the spectrum, dark lines the position of which did not change. William Hyde Wollaston observed a few of the same lines in 1802, but drew no strong conclusions from the phenomenon. In 1814, in a memoir entitled "Treatise of the Refractive and Dispersive Powers of Different Kinds of Glass," Fraunhofer published the results of his research on the dark lines that he found not only in the spectra of the Sun, but also of the Moon, stars, and flames. He measured the index of refraction for the different lines, which because they always lay in the same place in the spectrum, were an indication of the manner in which the rays of a particular color were refracted. He used the results of his research to mitigate the effects of optical dispersion, which is the source of phantom coloration that detracts from clear optical images. In 1821, Fraunhofer used a wire mesh to explore the dispersion effects of small slits, and found that his mesh produced a spectrum of the light he was observing. He used this array of evenly spaced wires, two thousandths of an inch thick and spaced four thousandths of an inch apart, to compute the wavelength of light of a particular color, a feat first accomplished by Thomas Young in 1802. Fraunhofer later used lines etched on a plate of glass covered with gold leaf to produce the same effect as the wire mesh. Such an arrangement is called a diffraction grating, and its properties were first examined by the American astronomer David Rittenhouse in 1786. Ritterhouse, however, did not draw any conclusions from his discovery. 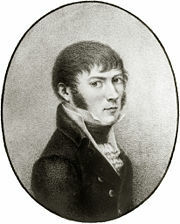 Fraunhofer published his findings in 1821 in a memoir entitled "New Modification of Light by the Mutual Influence and the Diffraction of the Rays, and the Laws of this Modification." In all, Fraunhofer mapped over 570 lines, and designated the principal features with the letters A through K, and weaker lines with other letters. It was later discovered by Gustav Kirchhoff and Robert Bunsen that the dark lines are due to the presence of elements in a [[gas] ] or vapor through which the light passes before its spectrum is analyzed. These scientists found that some of the lines in the sun could be reproduced by passing light through the vapor of sodium produced by burning sodium chloride in a flame. This led them to the conclusion that sodium is present in the Sun, and that the Fraunhofer lines in the solar spectrum are produced because the light of the Sun passes through its own atmosphere. Some of the Fraunhofer lines in sunlight are due absorption by elements in the Earth's atmosphere. In 1820 Fraunhofer was made a full partner of his firm and director of the institute. Due to the fine optical instruments he had developed, Bavaria overtook England as the center of the optics industry. Even the likes of Michael Faraday were unable to produce glass that could rival Fraunhofer's. His illustrious career eventually earned him an honorary doctorate from the University of Erlangen in 1822, and, in the same year, he was appointed keeper of the museum for the Royal Academy of Sciences in Munich. In 1824, the King of Bavaria awarded him the Order of Civil Merit. Like many glassmakers of his era who were poisoned by heavy metal vapors, Fraunhofer died young, in 1826, at the age of 39. His most valuable glassmaking recipes are thought to have gone to the grave with him. Fraunhofer's firm outfitted many of the respectable observatories of Europe with telescopes. A refracting telescope of almost ten inches diameter was purchased by the Russian government for its observatory at Dorpat. It is said that Fraunhofer had plans to execute a telescope lens of 18 inches. Fraunhofer invented the spectroscope, and discovered 574 dark lines appearing in the solar spectrum. He also came very close to a discovery made 40 years later that linked the patterns formed by these dark lines to the chemical composition of the light source. Fraunhofer invented the diffraction grating and in doing so transformed spectroscopy from a qualitative art to a quantitative science by demonstrating how one could measure the wavelength of light accurately. He found out that the spectra of Sirius and other first-magnitude stars differed from each other and from the sun, thus founding stellar spectroscopy. Ultimately, however, his primary passion was still practical optics. Although Fraunhofer investigated the dark lines in the spectrum for the practical purpose of improving optics, he was aware of some of the interesting theoretical implications of his discovery. It remained for others to reveal the impact of Fraunhofer's work. Much of quantum mechanics, which clarifies the relationship between particles and waves, is based on an analysis of spectral lines. Unfortunately, Fraunhofer did not leave details about the way he made his diffraction gratings, and his results were hard to duplicate because of the time required and the expensive equipment involved. Perhaps this is why 40 years passed before appreciable advances were made over his pioneering work. In the practical sphere, his work solved many of the problems that opticians had been grappling with regarding the chromatic distortion that plagued optical systems. Later designers of telescopes and microscopes built on his successes. Anonymous. 1827. Refractive and Dispersive Powers of Glass. Foreign Quarterly Review. 1:424-434. History of "Joseph von Fraunhofer"
This page was last modified on 8 June 2018, at 19:49.